I told you all that we recently went up to Rüdesheim am Rhein with Megan and Will. One of the the highlights of that day trip was drinking one of the most amazing coffees, developed in, and unique to, Rüdesheim and, hence the name, Rüdesheimer Kaffee. 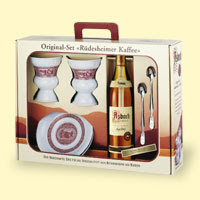 If you like sweets, coffee, cognac or fire you'll love a Rüdesheimer Kaffee. If you love all four then you'll be in absolute heaven after a sip of this unique German culinary delight. Of course, this coffee tastes incredible but what makes it really special is the production of the coffee which takes place at your table, right there in front of you. When the waiter arrives at your table he brings all the ingredients ready to be mixed right there. A Rüdesheimer Kaffee starts with a very unique cup, in shape and color. (Here's the cup on the right. The flame will be explained in a second.) Only a Rüdesheimer Kaffee can be made in this cup. When it arrives at your table, there are already two sugar cubes inside the cup. The first ingredient poured into the cup, on top of the sugar, is cognac. Not just any cognac, Asbach, which is produced right there in Rüdesheim. (To be completely correct, Asbach is technically a cognac but according to the Treaty of Versailles only French products can use the term cognac. Kind of a strange stipulation and penalty written into a peace treaty. Anyway, Hugo Asbach, founder of the company, coined the term "weinbrand," a name for German cognacs.) 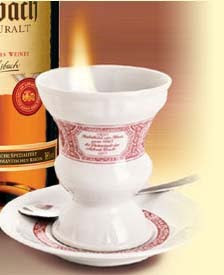 Once the cognac has been poured over the sugar the contents of the cup are set aflame. A brilliant blue flame results and the waiter will theatrically toy with the fire and, if more than one coffee is being made, transfer the flame from one cup to the next with the lit spoon. Once that show is over, hot coffee is poured into the cup, quickly followed by a very large dollop of whipped cream, which has already had chocolate shavings sprinkled on top, all gently placed afloat on top of the coffee. The only thing better than this whole production is the taste. Now, if you happen to have the good fortune to sample a Rüdesheimer Kaffee right there in Rüdesheim and decide that you just can't go on without more, you can buy a complete kit to take home with you. It's got everything, Asbach cognac, excuse me, weinbrand, cups, plates, and long spoons. I think the whole thing sold for 45 Euro, about $60. We'll take orders, with a small handling fee, from anybody that's already had a Rüdesheimer Kaffee and really needs one or anyone that hasn't had one but just wants to take a blind leap of faith and try this great German treat. Of course, you could make something similar at home without the kit but remember, if it's not a Rüdesheimer cup, it's not a Rüdesheimer Kaffee. It's officially the first day of winter. We've had some serious snow here the last few days. Big fat flakes and lots of it. Most of the airports here in Germany, and many around Europe, have been greatly affected. Here's what the German Wintermärchenland (winter wonderland) looks like in Weilerbach. A nice view of the snowfall out our second floor window. This is where Jeff and I sit when we sit at our computers. Jeff and I walked up the hill behind our house. Here's a picture of Jeff in the same place I took a picture of him last summer, kind of an interesting contrast. From the top of the same hill looking back down to Weilerbach. When we got back to our house we were a little warm so jeff said we needed a refreshing winter beer. Our patio was the perfect place for a Schwaben Brau Marzen. From our second floor window we watched this old guy drag this big Christmas tree up the hill to the intersection below our house. Guess he got tired because these two other guys and their car showed up to help. We live at an intersection about a third of the way up a relatively steep hill. What makes it difficult to get up our street after a good snow is that at the bottom of our hill you have to make a ninety degree turn to start up the hill. So, you can't carry any momentum into the turn and up the hill. You might say, "Big deal, I live on a hill too and don't have any problem in the winter." What you have to remember is that the street up this hill and all the streets around us are not plowed, ever. It's interesting to watch from our window. One car trying to get up the hill when another turns the corner to go down. Then another shows up at the bottom hoping to have a little momentum to make it up the hill only to see two obstacles in front of him. Here's an example of the mess that can occur right outside our window. It happens every day when it snows. Sounds like there's more on the way before, and during the Christmas weekend. Hope you all have a white Christams, unless you're in Florida or some other place where snowfall causes total chaos. Megan and Will left last Monday, back to the States. Here's some of the bits and pieces of the things we did with them after our Bavaria trip. I drove Megan and Will up to Bernkastle on Thursday where they spent the night and had a great time walking around the town and visiting the Christkindlmarkt, especially after it started to snow. Jeff and I picked them up the next day and we stopped in the birthplace of communism, Trier, on our way home. Trier happens to be the hometown of Karl Marx. We did the Christkindlmarkt there too. Porta Nigra, the ancient Roman gate in Trier. Yep, even more Trier Christkindlmarkt. On Friday we drove up to Kirchheimbolanden, the town we lived in 22 years ago. Showed Megan and Will our old house and walked around the city center. The obligatory Jeff-with-wild-boar (Warthog substitute) picture. He can't walk by this statue without getting his picture with it. This is in the city square in Kirchheimbolanden. Saturday we drove to Rüdesheim. Ferried across the Rhine, took the cable car up to the Niederwald Denkmal again, had a very nice light lunch and then, yes, you guessed it . . . their Christkindlmarkt. Their winter market turned out to be one of the very best we've visited this year. Rüdesheim is already such a pretty town and the market just made it a wonderful winter experience. On our cable car trip up to the Niederwald Denkmal we passed this car going down. You can see the vineyards in the back and a little bit of the Rhine River. Some of the vendors at the Rüdesheim Christkindmarkt. You can see the way the Germans trim these Maple trees each fall all the way back to a knobby knub. Ever the Vikings fan, Jeff had to get some horns. Man, did this vendor see us coming. Jeff the bull, Megan the moose and Will the ram. Here are Megan, still with her moose antlers, and I on another ferry, further north up the Rhine, crossing back over. The building in the background is Burg Pfalzgrafenstein a toll castle that sits on a small island in the middle of the river. The Rhine was very high this day and the island was completed flooded over. We all celebrated Christmas together on Sunday. We opened our gifts, ate a big Christmas ham dinner, did a little drive around Weilerbach and the surrounding area (Megan wanted to sit on the BAB) and watched some football. The following morning, regretfully, we drove them to the Frankfurt airport for their flight home. Megan with the new GPS we got her and Will for Christmas. Just like a little girl with a new ballerina outfit, she had to wear her moose antlers all day. We got these signs for Megan's and Will's dogs so they know where they can and can't go. Megan and Will on the BAB. The time went by so fast and I can't wait to see Megan again. Hopefully it'll be some time soon. Thank you Megan and Will for the wonderful visit. Well, we’ve been getting some appreciable snow fall the last couple weeks. Here in Germany, when that happens, there are snow-clearing requirements, should you happen to have a public or private sidewalk/driveway on your property. In Germany, it’s your responsibility whether you’re the homeowner or the renter; if you’re living there, it’s your job. These responsibilities aren’t just a nice thing to do or a social expectation, it’s German law. If an accumulation of snow could cause normal people, taking regular precautions to slip and fall then it must be removed. During a period of day-long snow, it’s expected that snow removal is an on-going job which may require sidewalks and driveways to be shoveled repeatedly during the day. The generally accepted hours when you're expected to keep your walkways clear are 0600-2200 (6AM-10PM). Just because you happen to be at work, it’s not OK to allow your sidewalks to accumulate snow that could become a hazard. I’m not sure what you’re supposed to do in that case other than go home during the day to shovel or arrange for someone else to do it. Jeff out shoveling the snow before going to "work." Interesting mixture of clothes here. The jacket was issued by the Air Force to Jeff at K.I. Sawyer AFB, Michigan in 1976. The boots and gloves were issued at Eielson AFB, Alaska in 1996. Don't have much use for these in Texas. In most German cities, towns and villages, only the main roads are plowed. From what we can tell, neighborhood streets do not qualify as a main road. If you don’t live on a main road, then in addition to being responsible to clear your own driveway and sidewalks, you are also responsible for half the street in front of your home. If someone slips and falls on your walkways or driveway and is injured you’re liable. If you hadn’t cleared the snow, you’re in trouble. Obviously, some liability insurance is advisable. Germans are people that like to get out and walk, early morning or during the evening hours; they like to get out and about. So keeping walkways clear throughout the hours mentioned is no-kidding a good idea. If you don’t, at the very least you’re going to get the evil eye from the exasperated Germans. At worse, you might get somebody else’s medical bill. When we did a Pros and Cons list about moving to Germany I don't think this made the Pros list. Our daughter Megan and her husband Will arrived here in Germany, December 2, my birthday, for a holiday visit. Having our daughter with us on my birthday was, of course, a wonderful gift and blessing. The day after their arrival, Jeff and I, took them on a long weekend excursion of Germany. Friday we drove to Rothenberg ob der Tauber, the beautiful walled city in northern Bavaria. (Jeff and I are here in Rothenberg at the most photographed intersection in all of Germany.) Saturday we continued on to Munich with a stop in Dachau so that Megan and Will could do a tour of the Concentration Camp Memorial there. Once in Munich, hotel was just a very short walk to the Marienplatz so we walked through the Christkindlmarkt there and then spent a way-fun evening in the Hofbrauhaus. Even ran into some Texas neighbors there. Munich actually has around twenty different Christmas markets with varying themes, so Sunday we had a plan to experience six of them. First, we stopped again at the city's main Christmas market that takes place in the Marienplatz, wraps around the Rathaus and extends down along the shopping street past the Frauenkirche. Of course, while there we had to watch the Glockenspiel performance at 1100. Then we walked just a few blocks to the Rindermarkt where they have another Christmas market. Most of the vendors there sell items that allow you to build your own Nativity scene. Everything from a little baby Jesus, to all the animals, the wise men, everything you can possibly imagine. On the way to the Sendlinger Tor, one of the old gates to the city, we stopped at the Hackerhaus for a nice Hacker-Pschorr Spezial Helles, yes, beer. Then, at the Sendlinger Tor, another pretty but standard Christmas market. From there, just a few blocks to the Pink Christmas Market; a gay Christmas market. When I say gay, I'm talking about the sexual-context kind of gay, not the gee-I'm-happy kind of gay. There really wasn't much to the Pink Christmas Market, about ten tent vendors, nothing overtly gay but maybe I just don't know the signs and signals. Then back to Sendlinger Tor to hop on the U-bahn. The U-bahn took us up to the west side of the English Garden where we got off and then walked into the park and the Christkindlmarkt at the Chinesicher Turm. Given the location and the manageable crowd this was the best market of the day. The fresh snow, the vendors wrapped around the Chinese Tower made for a beautiful winter setting. Since we were bundled up and the temperatures weren't too cold, it was even a nice place to have a bratwurst and beer outside. The walk into and out of the English Garden was absolutely a winter wonderland. We got back on the U-bahn to go out to the Theresienwiese, the Oktoberfest grounds, where they hold a Christmas market with an international theme. We went out here because we wanted to see the Oktoberfest grounds. The festival here was pretty much a disappointment. Although quite large for a Christmas market it was a very crowded, shoulder-to-shoulder kind of crowd. It was indeed international. Vendors selling items and foods from all over the world. We walked through once and left. The next day, Monday, we drove to near the Austrian border to do a tour of Neuschwanstein castle. The weather had changed and, although it was a bit rainy, Neuschwanstein is always an impressive sight. The last time we took Megan to the castle she was just six months old and we carried her in her stroller up through the forest path to Neuschwanstein. Now here we were with her and her husband. After the tour we drove to Kloster Andechs for an evening meal there and some Doppelbock Dunkel. We spent the night in a wonderful hotel right there in Andechs. The five hour drive home on Tuesday was a bit long but it was fun to be with Megan and Will. Here's some pictures of our trip. Rothenberg Christkindlmarkt in the city square. Megan and Will over looking the Tauber river. Part of the city wall in the background. The Rothenberg Christkindlmarkt took place up and down streets, in various town squares and even in the alleys. Awesome half-timebered houses overlooked the main city square and Christkindlmarkt. Jeff is always amazed how restaurants fold their napkings so that he can wear them as a little hat. Here's the king and queen of Bavaria. Rothenberg is one beautiful sight after another. One of the many towers on our walk back to our hotel. Since Jeff and I had been to the Concentration Camp Memorial in Dachau five times we went to the city Christmas market while Megan and Will toured the memorial. Another nice way to pass the time while we waited for Megan and Will. One of the Munich Christkindlmarkt greetings. Jeff, me and Megan. The Marienplatz with the Rathaus tower and Glockenspiel. A pretty Gluwein vendor with miniture Frauenkirche towers, right in front of the real Frauenkirche. Nativity Market at Rindermarkt with a nice, life-size, pyramid-windmill food vendor. Sendlinger Tor, one of the old gates to medievel Munich. The Pink Christmas Market. Take a look at the gingerbread cookie around my neck. It's a gay cookie. Megan got it for a friend of hers. The Chinesicher Turm in the English Garden. This was our favorite market by far of the six we visited in Munich. The whole setting was beautiful. It was cold but we were bundled up enough to enjoy a beer, brat and pommes frites outside. Had to eat the food fast before it got cold. Maybe the first time ever that we drank a beer that got colder as we drank it. The entire English Garden was magnificent. It was great fun watching the kids sledding. The International Christmas Market on the Oktoberfest grounds was really a mad house. This picture is looking northwest and we are standing in the middle of what would be the arcade and carnival ride area during an actual Oktoberfest. The tents here are a fraction of the size of a big Oktoberfest beer tent. If you've been to Oktoberfest you'll recognize the Bavaria statue. We happened to be in Munich on St. Nicholas night, December 5. Here's St. Nicholas at the Chinesicher Turm. Children in Germany put their shoes outside their front door on December 5. If they were good during the year, St. Nicholas fills their shoes with candy. I started this with Megan 23 years ago when we first lived here in Germany and kept it up even after she got married. I drove over to her house to fill her shoes. Even did it at our hotel that night. St. Nicholas is sometimes accompanied by Knecht Ruprecht (Servent Ruprecht) who takes care of the bad kids. He puts tree branches in the shoes of those children. You can see the branches here in his back pocket. You can also see the whip that he might use to spank bad children. For some children, the appearance of St. Nicholas brings fear and foreboding since Knecht Ruprecht may be nearby. This Knecht Ruprecht and three others were terrorizing the crowds around the Marienplatz. Always an amazing sight. We walked up and did the tour which was really incredible. Since the last time we were here 26 years ago, they had build this observation deck. Very nice, unless standing on an open metal grid with a hundred feet of nothing below you gives you the creeps. I didn't go out there. Kloster Andechs is much more than a great brewery. Inside the church is magificently beautiful. But, we were there for the beer. Jeff and I with Kloster Andechs Dopplebock Dunkel. According to Jeff the world's greatest beer. Four schwein haxn, a grilled pork knuckle, one for each of us. The world's biggest fat pill, but you gotta have one. They are sinfully tasty. Our beer maid for our after dinner drinks. Megan and Will stayed in the King Ludwig II Suite at our hotel. Very nice and a little quirky, just like Ludwig. The throne in the King Ludwig II Suite. Well, that's it. A great trip and lots of fun with Megan and Will. They left, back to the States, yesterday and I miss my baby so much already.